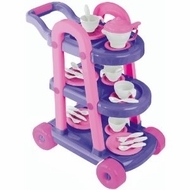 14000 Features: -Three shelves supported by sturdy side ruts and has over-sized wheels.-For ages 3 years and up. Includes: -Includes a 25 piece tea service for four, complete with a tea pot. Color/Finish: -Packaged in colorful corrugated carton with full color litho label. Assembly Instructions: -Assembly required. 21" x 11" x 19"